The Dark Knight Rises composer explains the movie's epic core. 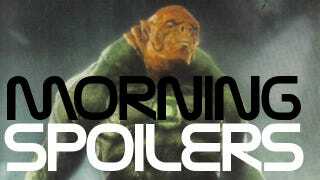 Plus a new look at Green Lantern trainer Kilowog! Longtime Batman composer Hans Zimmer explains why his score for The Dark Knight Rises will be his most epic yet. The Amazing Spider-Man costar Irrfan Khan explains how his character fits into the movie. Woody Harrelson isn't so sure about a sequel to Zombieland. There's a great new image of everyone's favorite ring-wielding poozer, Green Lantern's Kilowog. Plus Men in Black III casting, Abraham Lincoln: Vampire Hunter's surprising historical accuracy, and more! "The one thing I can tell you is that it's going to be a lot more epic. Extraordinarily epic. I don't know, it's like, 'What's epic these days?' I think there's something in the core of the story that allows you to get the music much bigger and much more sort of, iconic." "I play one of the villains in the movie. It is a pivotal role." "I'm sure it will happen if everyone does it, but I'm not sure it's the right thing to do. It's one thing to do it when it came out real good and it made a lot of people laugh, but then to do a sequel...99 out of 100 are worse by a lot. So I don't know. I don't feel like a sequels guy." "What's interesting about it is I realized how much history people don't know and how much about Abraham Lincoln in the script is factual, but because of the craziness of the story around it, it seems like the entire thing is fiction. But Abraham Lincoln's best friend was a black dude. So when he traveled south, he traveled with his boy." "Raphael [orders?] an attack on Castiel and his allies, sending a particularly frightening angelic hitman after Balthazar, Sam and Dean. In an effort to protect the brothers, Balthazar sends them to an alternate universe where they are the stars of a TV show called "Supernatural" and they are actors named "Jensen Ackles" and "Jared Padalecki." The brothers are confused when Castiel appears to be a tweet-happy actor named Misha Collins and Sam is married to Ruby (Genevieve Cortese)." "Sam, Dean and Bobby set out in search of The Mother of All's latest monster. While investigating, they run into Samuel and Gwen, who are also hunting the creature. Samuel and Bobby get into a heated fight about how to handle the case."